I’ve spoke about my love for napping before! If I get to point where I’m really struggling to keep my eyes open I will take a power nap if possible. I’ve realised there’s no point trying to plough on when I’m too tired to think. I usually decide to nap anywhere between 10 and 20 minutes and I set an alarm. This avoids waking up groggy and feeling worse than before. A nap of this length ensures once I’m back to work doing whatever I was doing I feel more refreshed. Taking a little bit of time out each day is so important. If I still feel really tired after my nap I know I’m probably on the verge of becoming run down so will follow the nap up with a cuppa to allow a bit of a longer break. 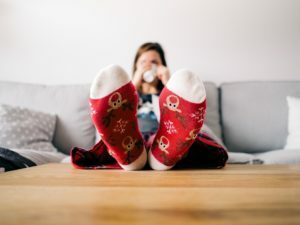 For many people dressing down or having a pj day at home will be their idea of self care. Don’t get me wrong, I adore getting into my pjs and chilling out. Dressing gowns definitely aren’t given enough credit! However, because I spend the majority of the week in workout gear with hair shoved in a pony tail and no makeup on, it’s a real treat for me to dress up and look nice. It makes me feel body confident. My nicest clothes make me feel good and I know when I feel good I look good! One of the most common self-care practices you will hear about is unplugging from technology. Whilst I couldn’t agree more with the benefits of this, the ability my phone gives me to easily stay in touch with my best friend is a god send. Between my busy schedule and hers, co-coordinating a meet up can feel a bit like solving a tough mental arithmetic problem. It’s not uncommon for us to have to go a nearly a month without seeing each other in person. But at the end of a long, hard or tiring day I know I can check in with her and it’s always one of my favourite parts of the day. Saturday is my day off. No matter what plans I have, I more often than not make sure I have a leisurely morning. I don’t tend to have a big lie in but I just take my time with getting ready. I just like to slow down and appreciate the fact I’m not rushing around. I’m not racing to switch the computer on by 8am; I’m not thinking about work. I’m usually up for 2 hours before I get dressed! I usually stretch out have 2 cup of teas and my breakfast over this time. Unlike the other days of the week, I choose not to go 100 mile an hour. It’s more like 10! If I had to choose between a bath or a shower I would always pick a bath! It’s impossible to not feel relaxed when you are immersed in really warm water. It’s cosy. It’s quiet. Baths are versatile. You can think in the bath. You can choose not to think. You can read in the bath. You can have a drink. The possibilities are endless! My singing is unfortunately nowhere near as good as my dancing. My mum used to say to me “pick a key Helen, any key!” She also used to say she knew when I was happy because I’d be singing. When I’m home alone and I’m working, cleaning, cooking or just chilling, I like to get YouTube or the radio on and get my sing on. I dart from 90s hits to 80s hits, rock to pop and then back to chart stuff. Not only do I dance like no-one’s watching, I sing like no-one’s listening! It might not sound good, but it makes me feel good!